Oops. First version released had some problems. Updated version now posted. Sorry! 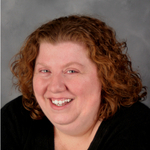 This week I’m bringing you a lively discussion with Jen Segrest. She’s a multi-talented graphic designer and crafter from Middletown, Ohio who isn’t afraid to speak her mind. I got in contact with Jen when I came across her fantastic bottle cap pincushions online. Her pincushion tutorials featured in the book “Pretty Little Pincushions (Lark 2007) and CraftStylish, changed my life. Months later, I’m still excited about covering bottle caps with felt. So fun! So check out the podcast for an interesting conversation about making pincushions, the difference between art & craft, Etsy, the benefits for crafters on Flickr and even a bit about Battlestar Galactica. Whether you agree or disagree with her comments about Etsy, art & craft, etc., feel free to join the conversation in the comments section below. Find out more about Jen at schmaltzycraftsy.com, verybigblog.com, and flickr.com/verybigjen. Check out her design work at verybigdesign.com and pixeldecor.com. And if you like BSG, too, check out her scificast. You can order a pincushion from Jen on etsy, artfire or 1000 Markets.com. 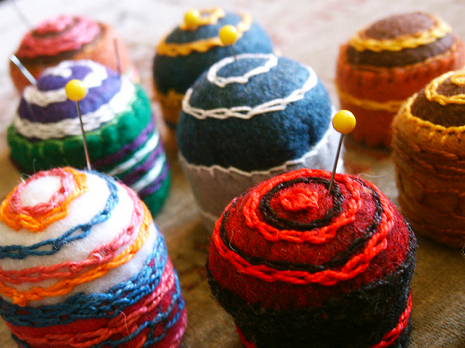 Hopefully, this podcast will inspire you to make a pin cushion, study up on Flickr and join a pincushion group or elist, and maybe check out a felt group, too. And thanks to Laurie at Wool Pets woolpets.com for supporting this episode. Check out her needle felting kits and supplies and the blog (woolpets.typepad.com). Buy a CraftSanity T-shirt or button or sponsor an episode.